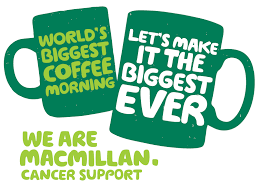 A final reminder about our coffee and cake morning in the clinic tomorrow, Friday the 25.9.15 from 9-12, in aid of Macmillan. We will be serving loads of delicious cakes and plenty of cups of tea/coffee in return for a donation to this wonderful cause. Please can you help us make it a huge success by popping in for a piece of cake and a cuppa! We have already had some generous donations and some lovely cakes from some of you, so “Thank You”! Please tell your friends and family they are more than welcome to pop in. Looking forward to seeing you tomorrow!